The cost of solar has declined significantly in the last decade and the Department of Energy recently outlined targets to reduce it by more than 60% by 2030. As a result of the increase in manufacturer capacity, however, consumers face a dizzying number of solar panel brand choices, which can make an already complex decision to go solar even harder. This guide covers how to think through the solar panel decision – if you are still looking for a solar installer, read our guide on how to choose a solar company. If you are interested in a solar panel kit for a self-install or off-grid application, read our guide on the best solar panel kits (this guide only covers the panels). The best thing you can do to make the solar process easier is to find a good trustworthy installer. Most installers offer several different brands of solar panels, so even if you have found an installer it helps to know the basics. 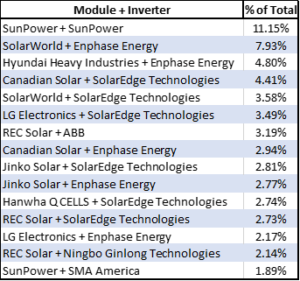 We have graded 12 of the top solar panel brands on the most important specifications and included a more detailed review and discussion of each panel. There are many features to consider when evaluating solar panel brands, including the panel efficiency, color, temperature coefficient and manufacturer warranties. 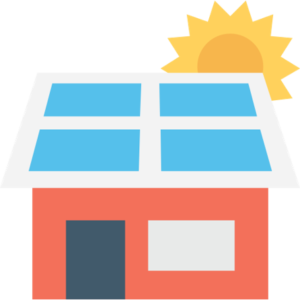 At OhmHome, we like to help consumers make smarter solar choices through data, so took it one step further. We supplemented our grading by analyzing over 100,000 records of residential solar installations (see below for full report) to determine the most popular solar panel manufacturers/panels. The most popular is not always the best, but with 40+ panels brands, it helps to know the top brands to include in your evaluation. The top three highest quality panels on the market today are SunPower, LG and Panasonic. They stand out from the crowd based on the efficiency (which determines how many panels you need), aesthetics, and quality. Most panel manufacturers offer a 10 year product warranty, while these companies offer 25 year warranties. Solar panels are easy to maintain, but if you own your system, a 25 year warranty can give you peace of mind if an issue arises. Between SunPower, LG and Panasonic, we recommend LG and Panasonic as they have panel efficiencies and warranties similar to SunPower, but at a better value. SunPower has a premium brand (the Apple of solar panels), so if that is not as important to you, we would recommend the LG or Panasonic. Remember that higher efficiency means less space, so if space is not an issue or if you do not need a 25 year warranty there are several other more cost effective panels to consider (SolarWorld, REC, Hanwa, or Canadian Solar). 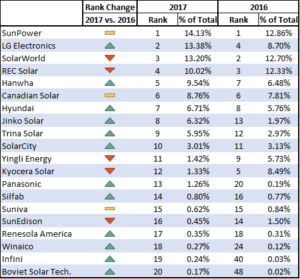 Kyocera Solar 1.3% 14.75%-16.11% -.45% 10 Years Mexico, U.S. Solar panel technology has been around for a while with Bell Labs producing the first panel in 1954, but it has taken years for panels to become cheap enough for residential applications (Stanford’s history on solar panels is fascinating). If you are not an electrician, solar panel technology specifications can be hard to make sense of, so we put together this quick summary on key terms you should be familiar with when comparing solar panels. The Department of Energy also has a helpful glossary of solar energy terms. A solar panel will have a nameplate capacity (ranging from 225 to 300 W), which is the amount of power that panel will produce in ideal conditions (e.g. full sunlight). A greater nameplate capacity means greater panel efficiency, or the percentage of sunlight that is converted into power. Solar panel efficiencies range from 15% to 22% and has increased significantly in recent years (SunPower and Panasonic have ~22% panel efficiencies). The most important thing to remember is that if space is an issue, you will likely need higher efficiency panels. Solar panel manufacturers offer a production warranty (typically 25 years) and a product warranty (10-25 years). The production guarantees are quoted as a % of nameplate capacity over time. As an example, SunPower guarantees that it panels will only degrade 8% (to 92%) at the end of year 25. A product warranty covers any product defects, which most commonly arise early on. The production guarantee is only valid of the panels are operational. If you want peace of mind and are purchasing your system outright, we recommend going with a panel that has a 25 year product warranty. As solar panels increase in temperature, the power output of the solar panel decreases. The temperature coefficient measures how much the output decreases based on the temperature (% decline per degree). Most solar panels are rated at 25 degrees Celsius, but almost always operate at a higher temperature. So if a 250W panel with a temperature coefficient of -0.40% is 40 degrees Celsius, the power output would decrease by 6% (40 – 25) X -.40%. The top tier panel manufacturers (SunPower, LG and Panasonic) sell through networks of installers, some of which are exclusive. So if you find a panel that you really like, you may want to check the manufacturers website to find local dealers/installers. 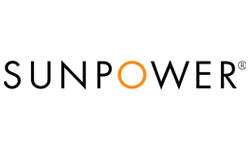 Sunpower , founded in 1985, is the leader in solar panel innovation and produces panels for residential systems to large utility scale products. The company offers the most premium panels in the market in terms of efficiency and warranty and prices are higher than standard panels. Sunpower panels have efficiencies of 19.5% – 21.5%, which means they generate more power and take up less space on your roof (great for projects where roof space is limited). As an example (see here for details), Sunpower’s 360W panel is the same size as a conventional 260W panel, but generates ~40% more power (360W/260W). In addition, Sunpower’s panels lose their power output slower than other panels, so the production over the life of the system ends up being ~60% greater. Another area of differentiation for Sunpower is the Company’s 25-year warranty which is a compelling offer for homeowners that do not want to deal with any hassles if issues come up with the system. The Sunpower warranty is longer (25 years vs. 10-15 years), covers the entire system (vs. individual components/warranties with other panel providers), and will pay for shipping and installation of warranty claims. Note that Sunpower sells its panels through a network of exclusive dealers, so not every local installer will have Sunpower panels. For more information, read the details on the X model (data sheet) and the E-model (data sheet). 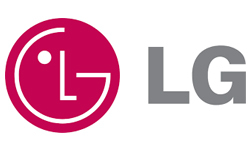 LG Solar is the solar division of the large South Korean company that makes everything from mobile devices to washing machines. They are also one of the first companies to offer an alternative to SunPower’s high efficiency panels. In 2017, the company released a new version of their high efficiency Neon R, which has efficiencies of 21.1% (within range of Sunpower efficiencies). LG also offers a black version of its Neon line, which is more aesthetically pleasing and blends into your home better (slightly less efficiency). Following the trend of other module manufacturers, in 2017 LG introduced a version of its Neon panels that is packaged with an Enphase inverter to reduce installation time. LG’s Neon R offer a similar 25 year warranty to match the Sunpower panels, but the other models have a 15-year warranty. 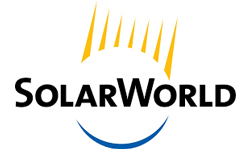 SolarWorld USA is the U.S. division of the Germany-based company and manufacturers panels in Oregon. The company offers two product lines under its Sunmodule brand – the Sunmodule Plus and the Sunmodule XL. The Sunmodule Plus are higher efficiency than the base model and also comes in a black version for better aesthetics. Solarworld offers a 20 year product warranty, which is one of the highest in the industry. Read more about the detailed product specifications here. 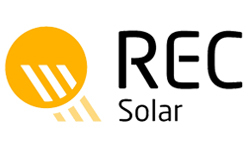 REC Solar (Renewable Energy Corporation) is the leading European brand of solar panels and was founded in 1996. The company is headquartered in Norway, but manufacturers its panels in Singapore. The company offers residential solar panels under its TwinPeaks and TwinPeaks 2 product lines, including a black version for aesthetics. The company offers a 10 year product warranty or a 12 year warranty if the system is installed by one of the approved installers. See detailed specifications for the products here (download fact sheet). 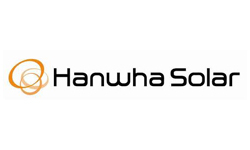 Hanwha Q Cells is the solar division of the South Korea-based Hanwha Group and has manufacturing facilities in China, Malaysia and South Korea. The company offers residential solar panels through its QCell brand, including a high efficiency Q.ANTUM DUO model that combines cutting edge cell separation and innovative wiring with the company’s Q.ANTUM technology. More detailed product specifications can be found here. 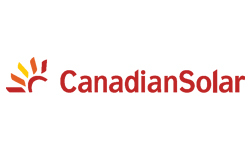 Canadian Solar was founded in 2001 in Canada and manufacturers panels in Canada, China and Vietnam with over 12,000 employees worldwide. Canadian Solar offers the widest range of panels under six lines (Ku Modules, Dymond, SuperPower, MaxPower, All-Black and Standard). In 2017, the company introduced its own high efficiency line, the Ku Modules, which have an efficiency of 19.15%. More detailed product specs can be found here. 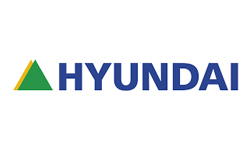 Hyundai Green Energy is the solar division of Hyundai Heavy Industries, which is related to the company that makes cars in the U.S. The company has been in the solar business since 2004 and manufacturers its panels in South Korea. Hyundai offers three product lines of residential solar panels – RF Series, RG Series, and RG Black Series. 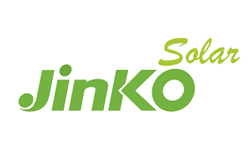 Jinko Solar is based in China and was founded in 2006 and is publicly-traded company with over 15,000 employees. In 2018, the company announced that it will be building a manufacturing facility in the U.S. in response to the tariffs. The company offers 8 product lines of panels including the Eagle, Eagle Plus, Eagle PERC, Eagle PERC Plus, Eagle Dual, Eagle MCT, 1500V Module, and the Smart Module. Detailed product specifications can be found here. 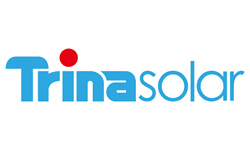 Trina Solar is based in China and was founded in 1997 and is largest manufacturer of solar panels in the world. In the past few years, the company has been listed repeatedly on the Fortune list for the top 100 of the world’s fastest growing companies. 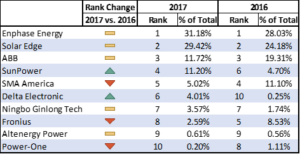 Trina Solar has also ranked in the top position of the Solar Scorecard of the Silicon Valley Toxic Coalition. The company offers residential solar panels under its DUOMAX and ALLMAX brands. Yingli Solar is based in China and was founded in 1998 is one of the largest manufacturer of solar panels in the world. 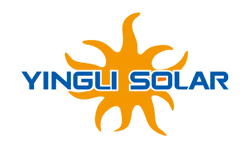 Yingli also operates a regional research and development facility in South San Francisco, California. The company offers residential solar panels under its YLM and YGE product lines (standard and black). Consumers may be familiar with the Yingli brand as they were sponsors of the FIFA World Cup in 2014. The company is also the first and largest panel supplier to Grid Alternatives, a California-based non-profit that provides solar power to lower income families. More detailed product specifications can be found here. 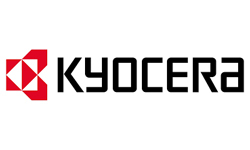 Kyocera Solar is the solar division of the electronics conglomerate based in Japan. The company has installed some of the most interesting solar solutions in places as diverse as a solar-lit highway in Brazil, commercial installations in Thailand and large-scale floating solar systems on reservoirs in Japan. The company is also the only solar module manufacturer to earn the highest rating across all categories in GTM and DNV GL’s PV Module Reliability Scorecard twice in a row. The company offers a variety of solar panels and the details can be found here. Panasonic North America is the U.S. division of the Japanese company that has made consumer electronics since 1918. The company offers panels through its HIT brand, which offers a black and traditional panel. The company’s HIT panels are high efficiency with upwards of 22.09% on certain models. 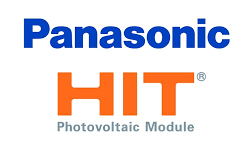 Panasonic also stands out from the other manufacturers due to its 25 year product warranty. Below are the summary charts from OhmHome’s 2017 solar panel report, which analyzes the most popular solar panels, inverters and combinations. The report uses data from the California Solar Initiative. The full OhmHome Solar Equipment report can be downloaded here.